For the first three days of April, celebrations will be held in Denmark to mark the bicentenary of the birth of the country's most famous writer, Hans Christian Andersen. Like every Danish child, my son Lukas, has a leather-bound collection of Hans Christian Andersen's fairy tales sitting prominently in the book case. My wife, Trine, from Copenhagen, bought the compendium shortly after Lukas' birth. Now, nearly six years later, as our son is making good progress with reading, and no longer requires stories with pictures, the moment has come, when Trine will start reading, in the original Danish, her childhood favourites, The Ugly Duckling, Clumsy Hands and The Emperor's New Clothes. We both fervently hope that 19th Century fables like The Steadfast Tin Soldier, which tells of the love of a one-legged toy sentry for a high-kicking ballet dancer, will fire Lukas' imagination - and demonstrate that heroes come in different forms from Superman, Spiderman, and the Ninja Turtles. "Danes love Hans Christian Andersen because he wrote with a social conscience and that is very much in tune with the Scandinavian way," says Trine. "He was the archetypal underdog, the son of a poor shoemaker, who became the most famous Dane ever." On Friday, Saturday and Sunday, Danes will be marking the anniversary, with celebrations taking place in the capital, Copenhagen, and in the town of his birth, Odense. Some 40,000 people are expected to pack Copenhagen's Parken Stadium on 2 April, for a "Once upon a time" show which will celebrate the writer and his work, as well as signal the beginning of 'Andersen Year'. According to the organisers, the star-studded show, featuring musicians, acrobats and dancers, and based on 12 of Andersen's most famous stories will be "the most spectacular fairy tale ever". Denmark's Queen Margrethe will lead the guest list, which includes a number of dignitaries and celebrities appointed Hans Christian Andersen ambassadors for this anniversary year. They are an eclectic bunch and include Elizabeth Hurley, Harry Belafonte and Isabelle Allende. 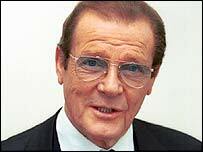 Among the more famous is Sir Roger Moore, former star of the James Bond movies, who has worked for children's charity Unicef for more than 10 years. "Hans Christian Andersen created a magical world with his tales of emperors, kings, princesses, birds, trains, toys, along with those of simple people and, of course, the unforgettable Little Match Seller," says Sir Roger. "Oh, what a tragedy that 120 million children are denied access to a primary school education. They can and never will know the wonder of this great author, playwright and poet." Lord John Hume, the former leader of Northern Ireland's non-violent civil rights movement and leading peace advocate, is Andersen's ambassador from Ireland. "This to me is the enduring legacy of Hans Christian Andersen. The seeking out of knowledge - education - is absolutely central both to the development of individuals and communities and to the fulfilment of life's wonderful possibilities," says Lord Hume. "I passionately believe that education is vital to improving people's lives, especially those suffering through poverty or oppression." 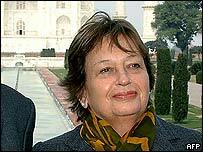 Testament to Andersen's power to inspire people around the world comes from Chile's First Lady, Luisa Duran de Lagos, who was seven years old when she was enchanted by The Princess and the Pea. The tale tells of the suitability test employed by a royal household, to detect the right bride for the heir to their throne. Staff placed a pea under bedding in the guest room, using the logic that only a true princess, used to superlative comfort, would be able to notice the difference. A real princess, disguised in ordinary clothes, joined a procession of social-limbing gold diggers hoping that their sleepover at the palace would enable them to marry up. "The suspense that Andersen gradually created in me, the desire to know whether the real identity of the young girls that went to the palace was going to be discovered or not, or whether the prince would marry the princess, prevented me from sitting down at the table when I was called to dinner," says Mrs de Lagos. "This story lingered on in my imagination, together with other Andersen stories that later in life I read to my children and hope to do the same to my grandchildren." 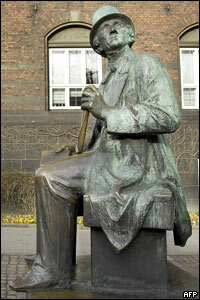 The organisers of Andersen 2005, due to end in the writer's home town of Odense in December, are hoping that similar sentiments will convince others to study the messages and morals of the Greatest Dane.